Situated in Napili Bay, Napili Kai is a traditional Hawaiian resort spread across 10 beachfront acres. 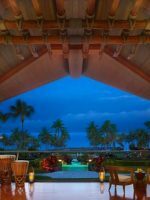 The resort is blended into the lush Lahaina environment, with 11 low-rise plantation-style buildings housing 163 oceanview guestrooms, studios and suites, many of which have full kitchens. Originally opened in 1960, Napili Kai decided from its start to keep things minimal and intimate. No buildings are more than two stories in height, and instead of offering clubs for families and kids to separate, the resort prides itself on providing a quiet reprieve for guests who truly want to spend time together. Four swimming pools, a long stretch of beach, and onsite dining is simply enough for the guests of Napili Kai, many of whom include the high-powered and celebrities blending in quietly with families as they play board games and enjoy rousing competitions like the Putting Party that takes place in the heart of the resort. It’s old-fashioned, good fun paired with an energetic and welcoming staff that are the reason 65 percent of guests return year after year. Napili Kai provides 163 guestrooms in a choice of traditional hotel room, or studio or one- and two-bedroom suites. Nearly all of the accommodations feature an ocean view, and all have private lanais. Rooms feature flat-screen TV's, DVD players and complimentary Wi-Fi. Cribs are available upon request. This choice of accommodations is a traditional hotel room with one king bed or two twins and a queen sofa bed. The room accommodates up to three people and includes a mini-fridge and coffee maker. These rooms are available with garden or ocean views. Studios may accommodate up to three in one large room with a king or two twin beds. Suites come with a fully equipped kitchenette with a full fridge. Keaka Family Studios are available with a king or two twins with a queen sofa bed and can accommodate up to four people with children 12 and younger. Studios offer garden or ocean views, or beachfront or oceanfront options. These accommodations offer oceanview, oceanfront or beachfront locations and can accommodate up to five people. These rooms offer a king and two twin beds or a king and queen sofa bed, and may offer a second bathroom. They are also outfitted with fully equipped kitchenettes with full refrigerators. Accommodating up to seven people, these suites provide two separate bedrooms, as well as sofa beds in the living areas, with a number of bedding configurations. Available in garden view, ocean view, or oceanfront locations, they offer two bathrooms and a fully equipped kitchenette with full refrigerators, too. 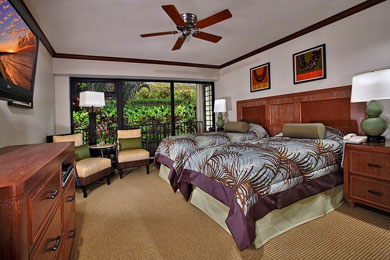 These special suites are connecting rooms to create two- or three-bedroom suite options, with connecting lanais. The rooms may be booked as one for a guaranteed connection, and feature ocean views. Room configurations include king or two twin beds or one queen with a twin sofa bed. The largest three-bedroom grouping can hold 10 family members. Rooms offer mini-fridges and coffee makers. When you want to get away from the all the craziness in this world 🌎 & you need to reset your self,this is the place you want to be. For starters,Napili bay is what Maui is about,Quiet, on the west side for the most Amazing sun sets & Mountain View’s that will leave you in amazement. Napili bay has Some of the BEST snorkeling w/unlimited sightings of sea Turtles 🐢 ,reef fish 🐠 🐡 🐟 and a full connection to the Ocean 🌊,if you there during the months of late December threw April, you can hear the whales 🐳 singing under the water. 2 Grandparents, 2 parents, and one almost year-old baby stayed for ten days in the Ohana suite. This is the largest suite in the property: two bedrooms, two bathrooms, well-stocked full kitchen, large living room. We oldsters stayed in the large master bedroom which had a shower only, while the new family stayed in the room with walkin closet just the right size for the crib, and the bathroom with a tub. The room is on the second floor and overlooks the putting green, so is called garden view. You pay for the size, not the view. It was more cost effective for us to have the one suite rather than two separate rooms, which gave us the very large living area: over 1900 square feet. Still, because of location it was not the most expensive room on the property. However, I was very glad that we got two free nights for that length of time. The location within the resort has also been perfect for us (except for the view): the parking lot is steps from our door, and has not been full even one day, for easy access with groceries and carrying baby. The spots are small, but there have always been spots. It is quiet because we are above the shop and have neighbors only on one side. And it is easy to get to the kiddie pool, which is adjacent to the main pool. The property provided us not only with the crib, but also with high chair and diaper pail, all free of charge. The balcony was perfect for an almost toddler, because standing on tiptoe he could just peer across the edge, and it was topped with a glass fence, so no danger of falling. Our only complaint was that the bottom cushions never stayed on the loveseats and couches. They all opened into beds we didn’t need, and the cushions kept scooting forward and falling off any time we sat on them. Owners take note: they need velcro! The service was excellent. The cleaning crew seemed to come by every time the baby was napping, so they just kept coming back every couple of hours until they found a time he was awake. 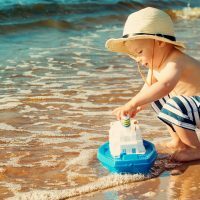 Unlike other reviews that complained about the beach towels, we found them generous, offering us extras and swapping out the towels multiple times per day, every time one got wet. We ate many meals at the somewhat pricey Sea House restaurant, but the food was always good, kids eat free, and we did takeout from them as well. The convenience was great, becuase our little one hated being strapped into the rental carseat. There are free daily activities. We particularly enjoyed making leis here. We ended up with five dendrobium orchid leis. We also had fun at the slack key concert, and the mini reef fish and lei lectures. We are very experienced snorkelers, so take our comments here in that spirit: we saw turtles, reef sharks, and octopus, but folks, this is not the Great Barrier Reef. The coral is virtually nonexistant, and the density of fish not very great. But for people who don’t snorkel much, it seemed to be an ecstatic experince. Alas, it rained and had high winds every day we were here. Nevertheless, we managed to get out on the beach between the raindrops, and at this time of year (midApril), the little bay was peaceful. My snorkel was never washed over by waves. Kids' activities are provided (at no charge) from mid-June through mid-August, Christmas and Spring Break/Easter for children ages 6 to 11. The resort offers free shuffleboard, checkerboard, Ping Pong, croquet, Bocce and weekly cultural activities, such as lei-making. The resort's main pool is situated between the Honolua and Lahaina buildings and near Napili Beach. The pool is adjacent to putting greens. The Lani Pool Deck and Hanki-Panki Whirlpool are considered quiet pools for adult use. There are also pools near Puna Point and Puna 2. 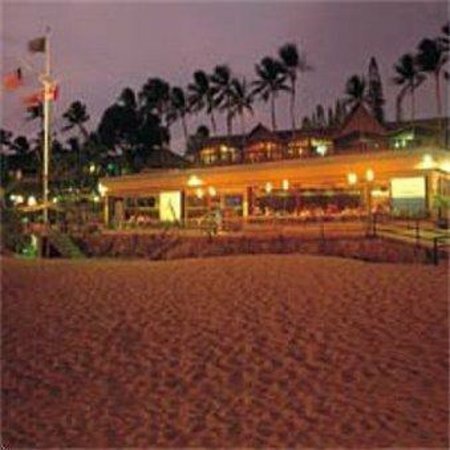 This pool/beachside location provides free beach and sports equipment to guests, and also serves coffee, lattes, milkshakes, smoothies and traditional Hawaiian ice. 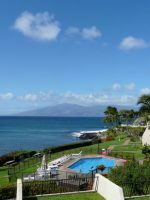 The resort is located adjacent to Kapalua's tennis courts, and Napili Kai guests are welcome to play the courts for a fee. Kapalua features two golf courses adjacent to Napili Kai, and guests are welcome to play at a special, discounted rate. The resort's only restaurant has been a staple for more than 50 years. The restaurant provides breakfast (7 to 11 a.m.), lunch (11 a.m. to 2 p.m.), dinner (5:30 to 9 p.m.) and snacks (2 to 5 p.m.). Kids 12 and younger can dine free with an adult purchasing an adult entree. Blackout dates apply through the winter holidays. A kids' menu is available and includes dishes such as pancakes for breakfast and burgers, hot dogs, BBQ ribs and pizza for lunch and dinner. All items on the kids' menu are $7 each. High chairs are available upon request. There are four complimentary barbeque areas on the property for guests to use. Napili Kai is one of the few resorts on the island that does not charge a resort fee. Here, parking is free, Wi-Fi is free, beach gear is free, and kids 12 and younger eat free with a paying adult. 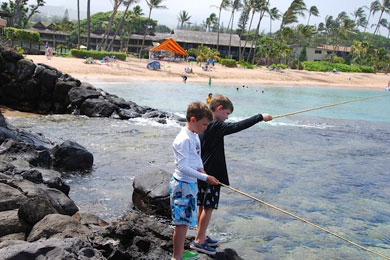 When the Keiki Club program is offered (seasonally), it is also free to guests. Washer and dryer facilities are located on the property with complimentary laundry detergent. For guests arriving or departing before check-in and check-out time, a hospitality suite is available with a shower and changing area so guests can enjoy the beach and facilities. 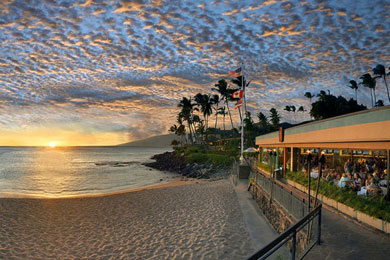 As is the case with most Maui resorts, high season is during the winter holidays, Easter and spring break and summer. The resort offers more for families during these high periods, but rates are also higher and the island becomes more crowded. However, Napili Kai's intimate resort never feels crowded, even during its high season. 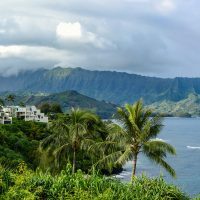 Napili Kai is located 35 miles from Kahului Airport, but travel time to the resort from the airport is about 50 minutes. Taxis will run around $120 and airport shuttles (with other hotel stops) will run around $75. Guests will want to have a rental car to visit other areas of Maui. Napili Kai is an 11-acre resort with only one restaurant and snack bar and only one clothing boutique. 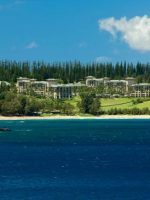 Kapalua Resort is adjacent to the resort and offers more dining options. 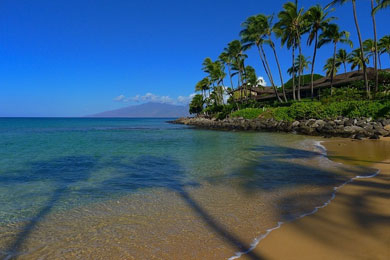 Kaanapali Resort, which offers more shopping, dining, golf and activities, is five miles south of Napili Kai. Every Monday, mom and dad can meet other new guests at the Adult Putting Party on the putting green with 50-cent drinks. Mai Tai parties are held every Wednesday night, as well.